The discovery of a corpse washed up on a beach in an Icelandic backwater sparks a series of events that propels the village of Hvalvik's police sergeant Gunnhildur into deep waters. Although under pressure to deal with the matter quickly, she is suspicious that the man's death was no accident and once she has identified the body, sets about investigating his final hours. The case takes Gunnhildur away from her village and into a cosmopolitan world of shady deals, government corruption and violence. She finds herself alone and less than welcome in this hostile environment as she tries to find out who it was that made sure the young man drowned on a dark night one hundred kilometres from where he should have been - and why. This is my second review of this book. I decided to re listen thru the whole series. Am happy to confirm my original impression. Good characters, good amount of procedure, and a wonderful feeling of what Icelandic life in the run up to their financial collapse might have felt like. What disappointed you about Frozen Out? Hard to say because the narration was so disctracting. But by an large, it seemed like a good crime novel. As mentioned, the jolly narration prevented any build of tension or sense of menace. Who would you have cast as narrator instead of Mel Hudson? Mel Hudson may well be perfect, but could someone clue her in on what fans of Scandinavian noir like about the genre. If you could play editor, what scene or scenes would you have cut from Frozen Out? Would you consider the audio edition of Frozen Out to be better than the print version? I don't know because I listen rather than read. Listening to this book was a delight. 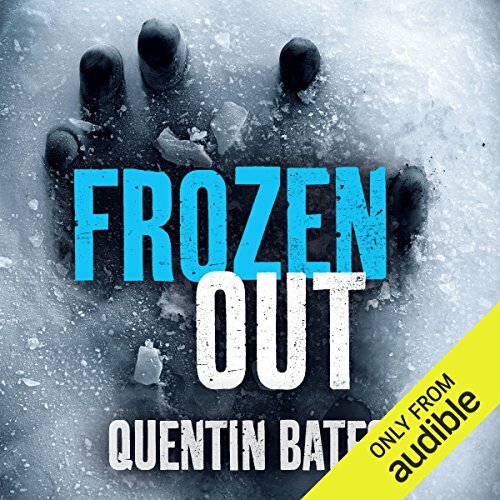 It kept me engaged and it compelled me to listen to all the other Quintin Bates books Audible has on offer. What does Mel Hudson bring to the story that you wouldn’t experience if you just read the book? He brings life to the characters and distinction between and among them. the narrator was distracting in her pace of reading, lilting narration and her attempts to produce character's names with an Icelandic accent. I had to stop listening as a result. May read on own as story itself may be good. This was a good story. The characters are believable as are their actions. What was one of the most memorable moments of Frozen Out? What about Mel Hudson’s performance did you like? Mel Hudson can produce a wide variety of character voices. Iceland is a country of born storytellers and a very large majority of Iceland's residents speak English. Why then, did the narrator have/use a British accent? That was very disconcerting and disappointing. Gunnhildur is a great Icelandic character. Having visited Iceland for a couple of months shortly after the financial collapse, I can say that the author has done a good job of depicting the Icelandic laid back national character, their willingness to accept others as they are, and their somewhat cynical view of life. However, the reader spoke with a British accent which was rather jarring, especially because she pronounced all the character names with a pronounced Icelandic accent. Of course, the names will take some getting used to which also complicates the listen. There are definitely some high points and some great scenes. But the ending was so unsatisfying that I cannot recommend the book. Perhaps the story is resolved in the next installment in the series. However, I do not like the book enough to pursue it through another listen. It was the Icelandic names that finally caused me to return this book. When pronounced in a British accent they just sound discordant. I know from other books that the narrator is certainly talented, unfortunately in this earlier work she is yet to discover her full talent. The intonation suffered from an annoyingly lighthearted, happy sound which to my mind was at odds with the content.